Abernethy Horticultural Society held a Treasure Hunt at the end of September which saw more than 50 participants follow a route around Abernethy gathering items and solving clues to answer questions as they went. 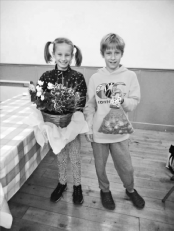 Everyone did very well, but in the end a closely fought 3rd prize went to the Hetheringtons, 2nd prize to the Mallinsons and pipping everyone else to claim first place were the Youngs (Hayley and Fraser pictured above with their prizes). Congratulations to the prize winners and thank you to everyone who participated. At the end of October we held a Hallowe’en themed apple event. Lots of apples brought in from gardens around the village kept the apple scratter and press running throughout the afternoon to produce lots of delicious fresh juice. The younger attendees enjoyed getting their faces wet with some traditional apple dookin’ and we had some fabulous samples of rare and local heritage variety apples and pears brought along for tasting. Wednesday 12th December Christmas Quiz – with festive food and drinks. Wednesday 9th January 2019 Beautiful Scotland Awards – Abernethy In Bloom, winners of a silver medal in 2018, have invited Adrian Miles, a judge for Beautiful Scotland, to talk about the Keep Scotland Beautiful campaign. Wednesday 13th February Plant Propagation – Jonathan Davies-Coleman, horticulture graduate from University of Glasgow and RHS Botanic Gardens Edinburgh, now at Glendoick. Wednesday 10th April – Sally Lorimore will talk about her garden, Willowhill, Newport-on-Tay, which has been developed by her and her husband over the last 20 years and regularly opens to visitors. All meetings are held at the Masons Hall starting at 7.30pm. As ever, these talks are open to everyone. If you are not a member you can join on the night (annual membership is £10) or can come along on a one-off basis for just £2.50 (which includes tea and biscuits! ).